With the success of his first root beer stand in Lodi, Allen soon opened a second stand in nearby Sacramento. It was there that what is thought to be the country's first "drive-in" featuring "tray-boys" for curb side service, opened up. In 1922 Allen took on a partner, Frank Wright, an employee from his original Lodi location. The two partners combined their initials - "A" for Allen and "W" for Wright and formally named the beverage, A&W Root Beer®. Three units were opened in Sacramento, then on to other northern and central California locations and to the states of Texas and Utah. By 1933, the creamy beverage was such a success that there were over 170 franchised outlets operating in the mid-west and west. To insure uniform quality for the namesake beverage, Allen sold A&W Root Beer® concentrate exclusively to each franchise operator. During World War II no new restaurants were opened and despite governmental sugar rationing and employee shortages most A&W® units remained successful. After the war, the number of A&W® restaurants tripled as GI loans paved the way for private enterprise to flourish. The first A&W® restaurant outside of the U.S. opened in 1956 in Winnipeg, Manitoba, Canada (the Canadian division eventually became a wholly owned subsidiary of A&W® and in 1972 was sold to Lever Brothers, Ltd., an international conglomerate.) In 1963, the A&W Root Beer Company was sold to the J. Hungerford Smith Company, the firm which had manufactured A&W Root Beer® concentrate since 1921. In that same year, the first overseas A&W® restaurant opened it's doors. Located in Guam, the international division quickly expanded to the Philippines. Many innovative changes were instituted. One was the formation of the National Advisory Council of the National A&W Franchisees Association (NAWFA). This elected board was among the first in fast food industry history to have a voice in system operations. System changes to meet franchisees' needs included the expansion of a nationwide distribution network allowing franchisees to purchase concentrates, food items, paper goods and glass mugs. And, programs offered by the corporation were revamped to suit franchise needs - training, marketing, accounting, product development, bookkeeping systems, building design and equipment layout. America loved the taste of A&W Root Beer®. So, in 1971, United Brands formed a wholly- owned subsidiary, A&W Beverages, Inc., for the purpose of making A&W Root Beer® available on the grocery shelf. First introduced in Arizona and California, the cans and bottles of A&W Root Beer® were an instant success. Retailers nationwide were soon carrying the product. 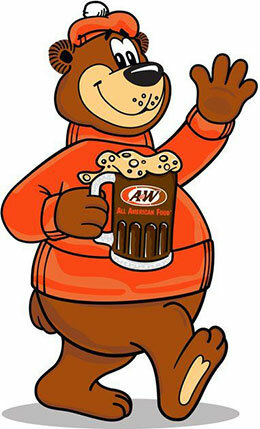 In 1974, A&W Beverages, Inc. introduced A&W Sugar-Free Root Beer and their goodwill ambassador, the Great Root Bear®. This life size, loveable mascot has been charming children and adults at grand openings, parades, fairs and community visits ever since. A standard core menu for the restaurants was introduced in 1978. It was the first time in A&W® history that there was a consistent menu offering. And, it was at this time that A&W Restaurants, Inc., the wholly-owned restaurant franchise subsidiary was formed. A. Alfred Taubman, a developer of shopping centers and real estate, purchased A&W Restaurants, Inc. in 1982, and a new era for A&W® had begun. A period of reorganization and planning began. Franchising efforts were halted while a new prototype was being developed, and new menu concepts and management techniques were being implemented. In September 1986, E. Dale Mulder, multiple-unit A&W® franchise owner and former Executive Director of the National A&W Franchise Association was appointed President of the corporation. Also, by mid-decade, the international division of A&W® restaurants had expanded its operations into 7 Southeast Asian countries. With Mulder's appointment, franchising had begun again and a steady growth plan implemented. An even stronger emphasis had been placed on serving franchise needs and providing assistance to the operators. In January of 1991, the momentum of the chain increased greatly with the addition of George E. Michel as A&W®'s new President and Chief Operating Officer. A 20 year veteran of A&W Food Services of Canada, Michel is credited with more than doubling the number of corporate restaurants during his tenure in Canada and is also recognized for guiding the company's growth by increasing the number and strength of the franchise operations. Michel guided A&W®'s expansion efforts into the captive, high-pedestrian segment with an immediate focus on opening new restaurants in food courts, shopping centers, office buildings and multi-use complexes. In January 1992, Michel became the Chief Executive Officer of A&W Restaurants, Inc. and continued to strengthen and lead the company toward targeted growth. Under Michel's watch, new A&W® food carts and kiosk units began being introduced to compete more aggressively in the alternative site markets. In December 1994, Sagittarius Acquisitions, Incorporated, headed by Sidney Feltenstein purchased A&W Restaurants, Inc. from the Taubman interests. The new ownership, backed by the investment company, Grotech Capital, grew with Feltenstein's long history of industry experience. (Feltenstein is a former Executive Vice President of Marketing for Burger King Corporation and a one time key executive with Dunkin' Donuts.) Continually growing, Sid Feltenstein fueled the purchase of Long John Silver's, Inc. in 1999.